This one-story, side-gabled house is three bays wide and single-pile with a gabled rear wing. The house has a brick pier foundation, German-profile weatherboards, six-over-six wood-sash windows, a standing-seam metal roof, and an interior brick chimney. The four-light-over-two-panel door, centered on the façade, is sheltered by a front-gabled porch supported by square posts with German-profile weatherboards in the gable. A shed-roofed porch on the left (south) elevation of the rear ell is supported by square posts and shelters a three- light-over-two-panel door flanked by sixteen-light fixed windows. A sign to the left of the entrance reads “P. W. A., Federal Emergency, Administration of Public Works, Little River Teacherage, Project No. N. C. 1127-F.” Warner Lane and the houses on it, are not present on the 1924 Sanborn map. 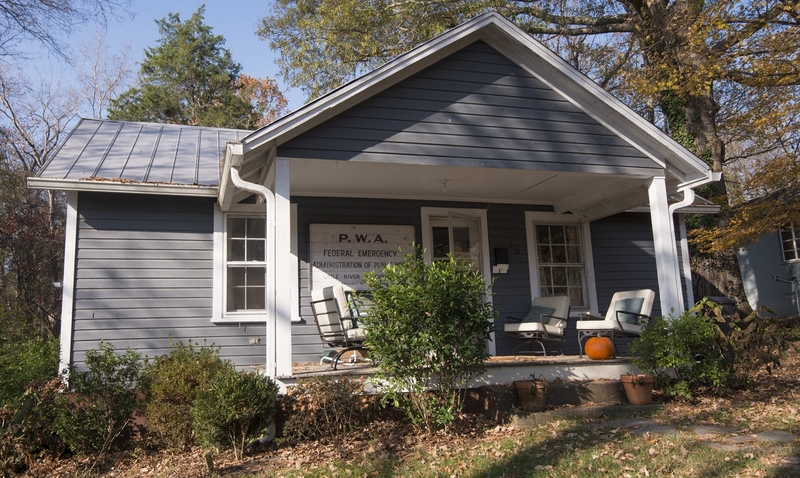 The P. W. A. was established in 1933 and the house appears on the 1943 Sanborn map.